To finally make it to Space Camp! And when I let friends know they asked how they can help, so I'm posting this in case anyone reading this also wants to help me make my dream come true. I set up a GoFundMe page for my trip. As of my writing, I'm already over 20% towards my goal! That's a selfie of my Mother's Day gift Ella made me. I had told her to not buy me anything, but to just put the money she would spend in a jar. So she made the jar. And yes, added some money. Well, I've always been a big nerd for one. But what is curious about my nerd story is that my love of space and the space program did not get started until the Challenger disaster in 1986 (warning, auto-play video of event). I remember that my 5th grade teacher, Mrs. K, talked that mission up to us. I guess that was the point of the mission, right? Anywho, I knew it was coming up and that Christa McAuliffe was to be the teacher in space. But the day of the launch we were on a field trip to Chinatown. I vividly remember being in a shop and my friend Katie S. walking up to me reporting the news. I laughed and said, "Yeah, right..." She insisted that she was correct. We found a TV playing and reality punched me in the gut. Back at school Mrs. K talked to us about what happened. For once she didn't have all the answers and from what I recall, she just kept talking as if she needed to keep talking. She spent a lot of time telling us how she had filled out the application herself, but something kept her from mailing it in. So that day was the catalyst that took the space program as something I kinda knew about and made it my new life mission. Soon enough I was obsessed. I learned the names, birthdates and significance of everyone on the Challenger. But I focused on Christa. I practically memorized her biography, which I still have, and was a walking Challenger encyclopedia. Then I did the same with the Apollo missions. In my limited research, I decided that the best path to becoming an astronaut would be to go to the Air Force Academy. Thus the summer before 8th grade I spent studying the Air Force Academy's entrance exam. I AM NOT KIDDING YOU! I set the timer on the stove and everything. My obsession was rewarded with a family vacation to Florida the summer before I started high school to the Kennedy Space Center. On the tour bus, the guide had a 5 question quiz for us. Guess who answered every single one in record time that made her mom bust out laughing and embarrassed the hell out of her little sisters. This girl. But for many reasons I never reached my goal of attending Space Camp as a kid. Even as I watched the movie over and over, begged for it from my working class parents, and seethed each time I heard of a classmate who did get to go. Ironically, on the same trip that I was the big space nerd, I also discovered marine biology. You won, Sea World!! Which is what I eventually focused on during high school and in college. But my desire to go to Space Camp has never waned. 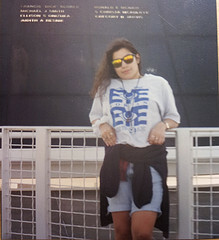 This is a photo of me at the Astronaut memorial during high school. 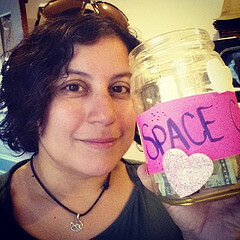 This isn't a big campaign, just a way for me to give my friends and supporters a chance to toss in a few bucks to get this big old nerd to Space Camp for her 40th birthday. My only incentive I can offer is a postcard and knowledge that I'm going to have a blast! Thanks to everyone who chips in. Ever thankful and blessed.